Oil Lift Cleaner Degreaser is an all-purpose formulation for when you need industrial strength cleaning results without the toxic side effects. This multi-use, eco-certified, Cleaner Degreaser provides superior cleaning performance while protecting consumers from the toxic side effects of most cleaners. Its concentrated format is economical to use and its powerful cleaning formula effectively replaces 90% of cleaners in residential and/or industrial applications. 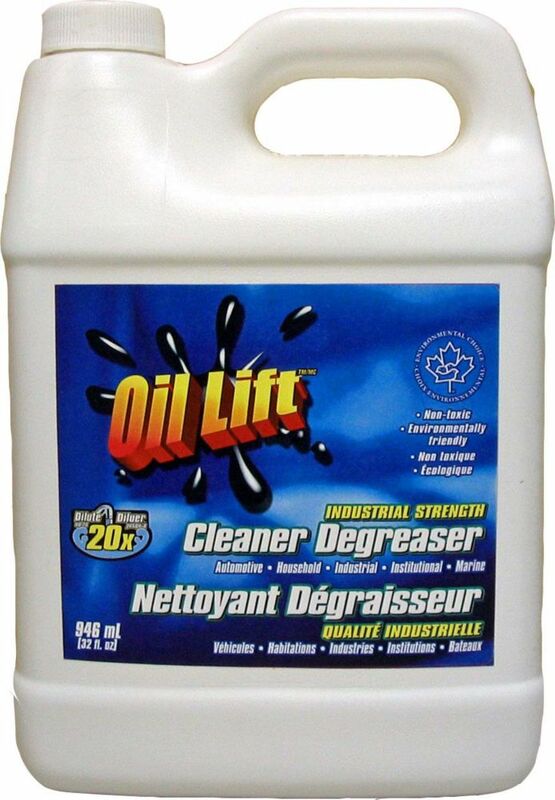 The Oil Lift Cleaner Degreaser effectively removes oils, grease, lubricants and many other tough stains and soils from every area of a household including the kitchen, bathroom and laundry room. Many outside surfaces present no challenge; garage and workshop, siding, gardening equipment and garbage disposal containers. Oil Lift Cleaner Degreaser removes the toughest soils and leaves surfaces sparkling clean. Exception: spot test before cleaning leather or other items that are not necessarily colour fast. Environmentally friendly formulation replaces 90% of toxic household cleaners. Multi-purpose and concentrated to save you time and money. A fast and effective way to lift out oil, grease and tar from concrete, terrazzo, granite, stone floors and asphalt. For use on: Factory and garage floors, pool decks, sidewalks, driveways, barbecue grills, machinery, motors, printing presses and more! Outperforms other degreasers in S.G.S. U.S. testing! 948 ml, Industrial Strength Concentrated Non-Toxic Cleaner-Degreaser Oil Lift Cleaner Degreaser is an all-purpose formulation for when you need industrial strength cleaning results without the toxic side effects. This multi-use, eco-certified, Cleaner Degreaser provides superior cleaning performance while protecting consumers from the toxic side effects of most cleaners. Its concentrated format is economical to use and its powerful cleaning formula effectively replaces 90% of cleaners in residential and/or industrial applications. The Oil Lift Cleaner Degreaser effectively removes oils, grease, lubricants and many other tough stains and soils from every area of a household including the kitchen, bathroom and laundry room. Many outside surfaces present no challenge; garage and workshop, siding, gardening equipment and garbage disposal containers. Oil Lift Cleaner Degreaser removes the toughest soils and leaves surfaces sparkling clean. Exception: spot test before cleaning leather or other items that are not necessarily colour fast. 948 ml, Industrial Strength Concentrated Non-Toxic Cleaner-Degreaser is rated 5.0 out of 5 by 1. Rated 5 out of 5 by Bob1949 from Good product Works amazing on any oil or grease on cloths and auto .